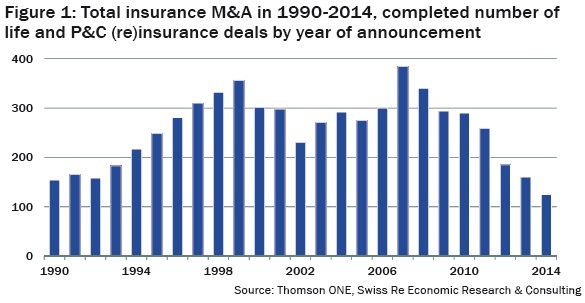 M&A activities in the insurance industry are picking up again. Mr Clarence Wong and Mr David Alexander of Swiss Re give an update on M&A happenings in both the life and P&C sectors as well as the general outlook in Asia. The overall amount of M&A activity in insurance in the years after the financial crisis has remained well below pre-crisis levels. However, the aggregate masks some resurgent activity in specific areas. M&A activity involving emerging market insurers and consolidation among some specialist insurance providers has picked up. Meanwhile, strategic sales of subsidiaries and closed books by insurers in the advanced economies has continued. Motivations for life M&A changed dramatically after the financial crisis, reflecting the deep changes in the economic and regulatory environment. Forced divestments by life insurers that came under severe stress during the financial crisis have driven some of the largest deals in the post-crisis period; repositioning of global players for balance sheet preservation has also become a key driver of strategic sales. In addition, the record low interest rates and new regulations such as Solvency II have prompted a number of sales of blocks of insurance business including fixed and equity-indexed annuities to alternative investors. Historically, Europe and North America have been the main target regions of M&A activity in the life sector. Since the crisis, the share of Asia Pacific of total transaction values has risen very significantly (see figure 2). Robust economic growth, rising insurance penetration, and large and expanding populations have made Indonesia, Thailand, Malaysia and Vietnam particularly attractive for foreign life insurers. Within Asia, Japanese life insurers have been especially active acquirers, as low domestic funding costs have encouraged investment in overseas markets where prospective returns are higher. However, inflated valuations and limits on investment have more recently been a drag on M&A activity in emerging markets, including Asia. 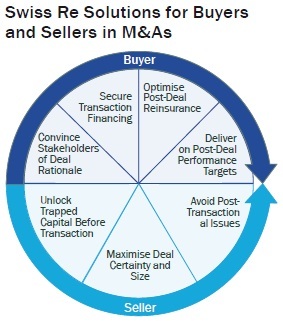 The strategic rationale for M&A in the P&C sector typically focuses on acquiring specialised underwriting and distribution skills, and optimising the scale of operations. The overall level of M&A activity in the P&C sector declined in the years after the financial crisis, and the average deal size also fell. The slow global economy and weak profitability due to depressed investment yields kept buyers’ interest subdued. Over recent years, the centre of M&A activity in the P&C sector has also moved away from North America to Asia Pacific, Europe and Latin America (see figure 3). In Asia Pacific, the largest domestic consolidation deals were in Japan, motivated by lack of organic growth opportunities and pressure to cut costs. Japanese insurers have also pursued acquisitions in Southeast Asia and beyond in a bid to diversify from domestic natural catastrophe risk exposures such as typhoon and earthquake damage. The fragile state of the global economic recovery and persistently low interest rates continue to pressure insurers’ revenues and profitability. With organic growth opportunities still limited in advanced markets, sentiment towards M&A as an alternative source of growth has improved. An upswing in M&A in insurance appears to be emerging, but it is unlikely to be an industry-wide wave, as volatile economic environment and regulatory uncertainties remain key obstacles to acquisitions. 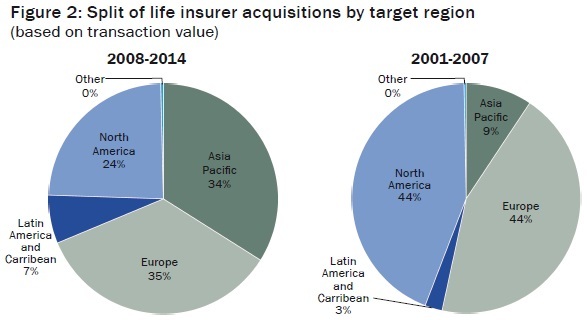 Large insurers from advanced markets will continue to expand their presence in emerging markets. Market liberalisation in countries such as India, China, Thailand and Malaysia will open up new opportunities. On the other hand, well-capitalised insurers and investors from emerging markets such as China are expected to continue showing interest in North American and European targets. This is driven by the need to diversify business, acquire underwriting and product expertise and increase distribution capabilities. In addition, the establishment of the ASEAN Economic Community could be an important catalyst for intra-regional M&A activity, once barriers to trade in services are reduced. M&A activity tied to bancassurance is expected to continue in Asia where it remains an important distribution channel. Insurers also reported that they will look for acquisitions or strategic partnerships with non-financial institutions to broaden their distribution capabilities, especially in gaining access to technology to establish and grow direct-to-consumer distribution platforms. The prospects of higher capital requirements and adoption of Risk Based Capital (RBC) frameworks in Asia could also stimulate more M&A activity. Consolidation among small- and mid-sized insurers is expected to remain intense. Private equity investors will continue to increase their presence in the insurance industry and are likely to remain active bidders. New capital market instruments through which institutional investors gain insurance risk exposure such as insurance-linked securitisation and sidecars and the entry of new types of risk carriers such as hedge funds offering collateralised cover are putting more pressure on incumbent insurers and could prompt renewed consolidation. Reinsurance can play an important supporting role in M&A transactions. Swiss Re offers solutions which are complementary to those of banks and advisers. As a traditional risk management vehicle, reinsurance can transfer unwanted risks of the acquiring or acquired entity, and absorb some of the heightened operational or transactional risks associated with an M&A. More generally, reinsurance can be an effective tool to manage capital adequacy by reducing liabilities following an M&A transaction. For example, reinsurance can be used to repackage risks to reduce peak exposures and achieve additional diversification benefits recognised in regulatory and ratings agencies’ capital adequacy models. In addition, reinsurance can be used to directly finance M&A transactions or as a complementary source of finance to traditional capital market instruments. Mr Clarence Wong is Chief Economist Asia and Mr David Alexander is Head of Business Development Asia at Swiss Re.